(Bay Ridge, Brooklyn)—Over 230 runners participated in the Harbor Fitness Race for Autism on Sunday, June 10, 2018. The Run helped to raise funds for HeartShare, which offers quality education and therapies to children and young adults diagnosed with intellectual and developmental disabilities, including autism. Jacinto Martinez was the overall first place winner and won a three-month membership to the gym. Rachel Marks, Trish Nersten, and Elpitha Vallas were the top three female participants and Jacinto Martinez, Edimardo Mendes, and Jose Gutierrez were the top male runners. The race started and finished outside of the Harbor Fitness gym at 92nd Street & 4th Avenue in Bay Ridge. Along the course, participants ran through the historic Fort Hamilton Army Base. Fatma, the sister of a HeartShare School student, spoke at the event. “At first, Adam didn’t know how to express himself. At The HeartShare School, I’ve watched my brother grow into the young adult that he is today. The HeartShare School is not only a place where my brother attends, but the staff has become part of our family. The team is welcoming, nurturing and always exceeds our expectations,” she told the crowd of runners. 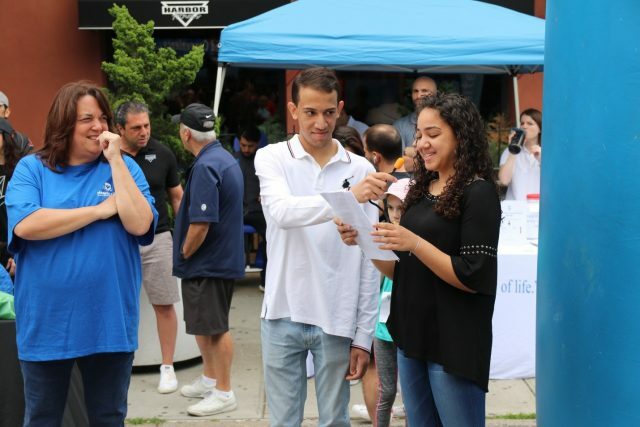 Omar (left) and Fatma (right) talk about the academic and personal growth of their brother Adam at The HeartShare School during the Harbor Fitness Race for Autism on Sunday, June 10, 2018. Students of The HeartShare School were excited to run the race and participate in the activities, including music and dancing, arts and crafts, face painting, and rides. “Many of the students who attended are from the Children’s Residential Program. The students from our school came from all over Brooklyn, Queens, and the Bronx. They’re excited because the run celebrates them,” said Sharon Toledo, Director of The HeartShare School in Bensonhurst. For over a decade, the Harbor Fitness event has raised autism awareness and supported HeartShare education programs. “We are grateful to our partner Harbor Fitness, who continues to host this run for the benefit of our children and teens with autism,” said President and CEO Bill Guarinello. “The Race for Autism is not just exercise for our students, but also a form of inclusion and community building. Thank you Harbor Fitness!” Guarinello said. This year, Harbor Fitness also trained HeartShare’s inaugural TD Five Boro Bike Tour team. Lisa Lekacos, Harbor Fitness Manager at the Bay Ridge branch, shared what the race meant to her. “There are so many people personally and professionally whose lives have been impacted by autism. The work that HeartShare does is so important and positively impacts many children and their families. It’s an honor to be able to support them,” she said. Momentum Real Estate, Starbucks and other local businesses contributed to the charity run by providing food, refreshments, and games. Sarrica Physical Therapy provided free massages and other physical therapies to the participants after the race. For those who enjoy competitive races, HeartShare also has a participating team in the NYC Marathon. To join the team, please reach Mario Principato at Mario.Principato@heartshare.org or 718-422-3213. For more on HeartShare’s pre-schools, visit www.heartshare.org and for more on The HeartShare School, visit www.theheartshareschool.org.